Akemi Nakano Cohn studied traditional Japanese dyeing technique for 10 years under the master Haru Izumi. Cohn earned her MFA in Fiber arts from Cranbrook Academy of Art in Michigan and her BFA from Tama Art University, Tokyo, Japan. 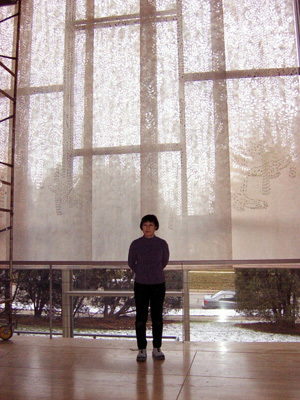 Cohn has taught at the School of the Art Institute of Chicago, as well as workshops at Haystack, Penland, Arrowmont, Int'l Surface Design Conference, and Zijdelings(Netherlands). Her national and international exhibits include the Museum of Arts and Design(NY), The Bellevue Arts Museum(WA), University of Nebraska, and Gallery Uesuto(Japan), and she has been an artist-in-residence at Anderson Ranch and Ragdale Foundation. Commissions include Unitarian Church of Evanston, Loyola University Medical Center. She received The Best-of-show award from New Fibers 2006 exhibition, Chicago Community Arts Assistance Program Grant.